Rep. Martha McSally (R., Ariz.) flew A-10 Warthogs in Iraq and Afghanistan and is now fighting to make sure the Pentagon does not scrap them from the budget. In a letter to President Barack Obama and Defense Secretary Chuck Hagel, McSally wrote that the decision to retire the A-10 would "put American lives at risk." McSally is a retired Air Force colonel and has 325 combat hours in the A-10 in Iraq and Afghanistan. She also commanded an A-10 squadron. "From my experience as an A-10 pilot and squadron commander, I know first hand the unique capabilities of the A-10 in close air support, forward air control-airborne, and combat search and rescue missions," McSally wrote. "The Warthog is anything but a ‘single mission aircraft' and there is simply no other asset that can match its lethality, loiter time, and survivability. The decision to retire it is reckless and will put American lives at risk." 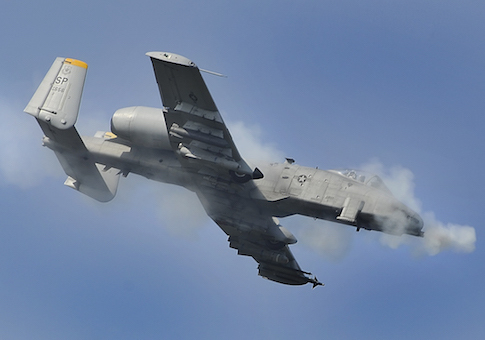 The A-10 Warthog was a Washington Free Beacon Man of the Year in 2014. This entry was posted in National Security and tagged Barack Obama, Chuck Hagel, Pentagon. Bookmark the permalink.